As coaches and managers, you are a vital part of your organization. The step-by-step instructions below will help by integrating into one single location: player information, email messaging, game schedules and results, team news, and more. If, at any point, you believe you should have access to something and do not, contact the . Click on the links below for step-by-step instructions for using features of the website. In order to perform administrative tasks as a coach, you'll first need to login to our site. As a coach, you simply need to login with your email address and personal password that is on your account. You do not need a special or separate password for coach access. 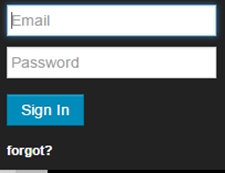 Click on the SIGN IN icon in the upper right corner of the page to expand the log in fields. Click the SIGN IN button. If you don't remember your password, click the forgot? link. You will receive an email from Pleasant Hill Baseball Association (PHBA) with a link to create a unique password. Click on the link in the email and follow the online steps to create a unique password. From there, you will be redirected to the PHBA site to log in with your new password. Note: Please contact the PHBA Webmaster if you encounter issues accessing the site or get a message that your email address is not valid. Be sure to include your full name in the message. 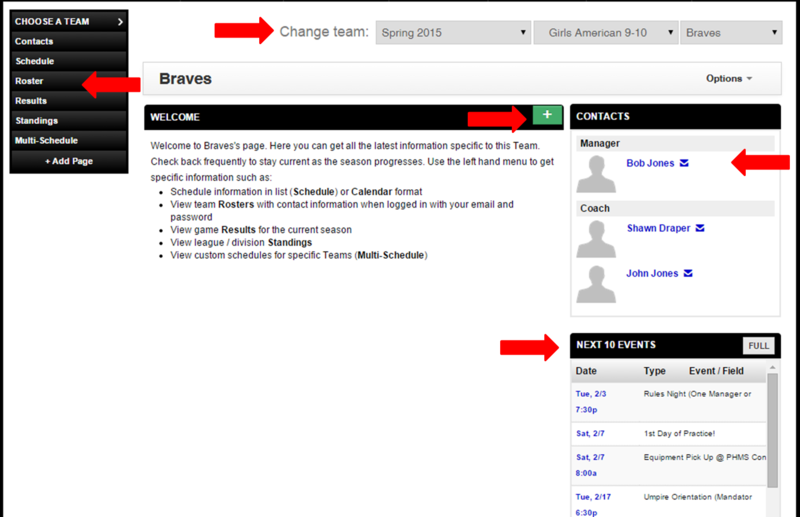 Once logged in, you can access your team's pages by navigating to it from the Home page. Hover over the Teams tab. Hover over Choose a Team. All teams in the site are housed here. Choose the League > Division > Team Name. You will go to your Team Page. After the first time you have navigate to your Team Page, the site will remember. Next time, all you have to do is click on Teams to go your Team Page. If you coach or manage multiple teams, the site will remember the last Team Page you visited, therefore, you may have to navigate to a different Team Page. Note: Please contact the PHBA Webmaster if you have any questions. View the password-protected Roster, including player and parent contact information, in the left side menu. Only managers, coaches, and team parents can see contact information. View the Schedule and Next 10 Events, including practices, games, and team and league-wide events. Practices times are announced on Rules night and will be posted to the site by February 1, 2016. Official Game Schedules will be available after March 1, 2016. Contact the Manager and Coaches (this is available to parents as well). Jump to another team in the same or another division. As a coach or manager, you have rights to email your team from the Roster page on your site. Log in to the site and go to your team's Roster page (left side menu). Click on Options in the top right corner above the Manager/Coach names. Select Email Team in the drop down menu. Compose your email and click Send. News Bulletins are a great way to communicate with your team's players and parents. These are displayed on your team's home page with the newer items displayed at the top. You can also email bulletins to players and parents using the "Broadcast" feature during the edit or creation process. Use this feature to send information about Team Events and Meetings. Click the to add a new News item . Complete the fields, such as Author, Publish Date, Title, and Content, on the Messaging/Add Team News page. The Content field has options for formatting text, adding tables, and links. If you need any help, click on the Question Mark (?) symbols next to the fields or the How-to Links below the Content field. Scroll to the bottom of the page. You only have the rights to post to your team's page (which will be highlighted in the Recipient Teams field). 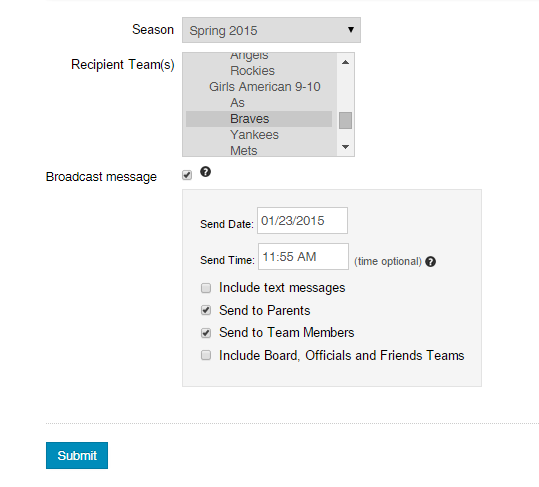 Check the Broadcast message box to send an email to your team with the news article's content. You can select a specific date and time to send the article. Click Submit to save and post. Team News articles can be edited or deleted by any of the coaches or managers on a team. Note: Please contact the Webmaster if you have any questions. Practices and Games are loaded into the system by the administrator. The schedule will be visible on the main Team Page as well as on the Schedule page linked in the left side menu. Via the Schedule page, you can check player availability and send "RSVP" emails. Log in to the site and go to your team's Schedule page (left side menu). Find game or practice and click on RSVP icon. The RSVP page lists who is Attending, Not Attending or not responded yet. Click on the No Response envelope to send an automated email asking parents to confirm if the player will attend the game or practice. No log in needed for the parents to confirm via the automated email. Click on the Attending or Not Attending envelope to send a customizable email to the parents. If a parent confirms or declines outside of the system (e.g., via a personal email), you can edit the RSVP page yourself. Find child in one of the three columns. Choose the green thumbs up for Attending or the red thumbs down for Not Attending. Click on Teams to return to main Team Page. Game results can only be added once an event's start time has passed. Once a game has been played, coaches or managers can enter results on the team's Results page. While the Home team should be the one to enter the results, the Away team's coaches and manager can enter the scores as well. Navigate to the team's Results page. If an event does not have a score entered, click the orange Edit button button. Enter in the result details, and Submit to save. Note: Use the Write Up section to enter feedback about the game, field conditions, umpires, or injuries. You can review comments and statistics entered by opposing teams by clicking on the blue (i) icon on the Results page. Once your game results are submitted, you can enter stats for the game . You'll enter stats from the same Results page that we used to enter a game's score. The default for each team is to have the statistics available to the public unless your commissioner has indicated otherwise. If you would like your stats to be limited to managers/coaches or team members, please contact the PHBA Webmaster. If an event does not have stats, the stats button will be gray click the button.